A great upper body is incomplete without chest training. Find out why you shouldn't be copping out of your chest workout! When most women approach their trainers with their results wish list, they hope for a firmer stomach, shapelier glutes and thinner thighs. Trainers almost never hear a woman say, "I want a firmer chest." In fact, most females are under the impression that chest training should be left out of the picture! To these women, chest development should be left to the men. They're afraid chest training will make them less feminine. Ladies, that thought process is junk! Just trash it. If you want a complete program and a body to be proud of, you need to include chest training. These busted myths and programming tips will help you get past your fears and lead you to a chest revelation! This myth gets perpetuated because female bodybuilders sometimes hit the stage with flat-looking chests that are far from what we normally deem feminine. It's not the muscle that makes their breasts smaller; it's the extreme diet. Most bodybuilders walk on stage with body fat levels that are far lower than what's considered healthy for a female. Breasts are primarily fatty tissue, so when body fat levels go way down, so do breasts. Aside from the women who have implants, most fitness and bodybuilding competitors just don't have enough body fat to keep their bras full. Don't be afraid to press serious iron, girls. As long as you sustain body fat levels that are well within a healthy range, you won't have an issue. According to the American Council on Exercise, women need to have at least 10-13% body fat for "basic physical and physiological health." Dipping below 10% (for ladies) may bring "underfat" health risks. This myth just makes me laugh. Supposedly, with some bench pressing, your breasts will go from soft to rock hard. Who needs a sports bra now? Training your pecs will build muscle underneath the fat makes up your breasts. As long as you aren't dieting too severely, your fat mass should remain. If anything, the added muscle helps your breasts appear fuller and might actually give a little boost to your cleavage! Most women add push-ups to their regular routine as an afterthought and then wonder why their upper body isn't looking better. As with any other muscle group, you need a sufficient level of exercise variety and weight resistance training in your program. 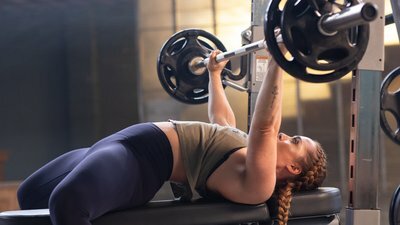 A combination of bench press, incline bench press, cable or dumbbell flyes and push-ups is the variation and difficulty you should be aiming for. Once you reach a certain level of fatigue, push-ups aren't going to do much for maximizing strength gains. Unless you put a plate on your back or find some other way to add resistance to push-ups, they're not going to help you get stronger. Instead, add them to the end of your workout as a finisher. It might seem like a good idea to use light weights for "tone," but remember that muscles respond best to a challenge. If you lift light weight for high reps, you'll be making very few fitness improvements and won't be doing much besides burning calories. You won't gain muscle mass unless you're eating a high-calorie diet -- all the heavy lifting you do on a standard or fat-loss diet will increase fitness and strength, but you won't get big, so don't be afraid to lift heavy! Keep your reps within the 8-to-10 range for bench press and incline bench press. For flyes, take it up to 10-to-12. 2-to-3 sets of each exercise will be perfect for strength gains. Any more or less may not produce the results you want. For compound lifts like the bench press, rest one minute between sets. Also, try to hit your compound lifts at the beginning of your workouts. Between sets of flyes, decrease your rest to 45 seconds. Because you're just using your body weight for push-ups, rest only 30 seconds between sets. Depending on your current workout split, you can work your chest muscles up to 2-to-3 times per week. Make sure you take a day off between workouts. If you're using an upper/lower body split, add this chest workout to your upper body days. If you're feeling really frisky and want to add other compound movements before the accessory lifts, go for it.